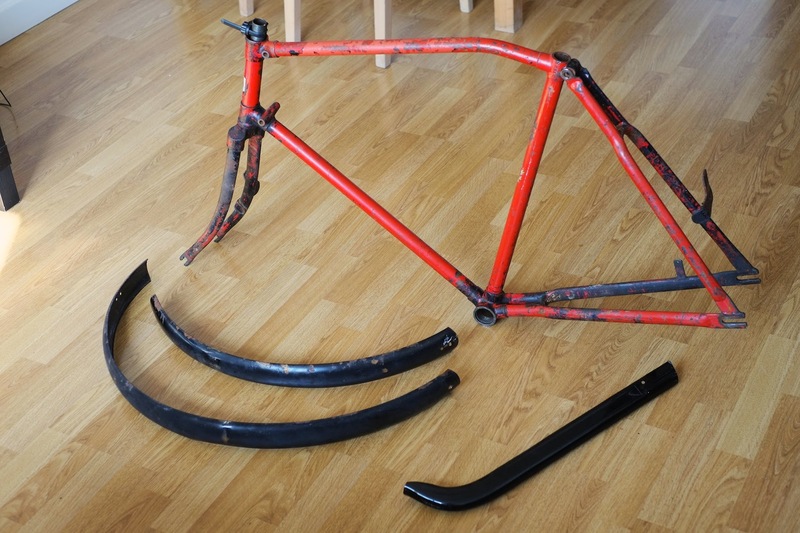 Now the first step of this build is the disassembly of the existing frame. 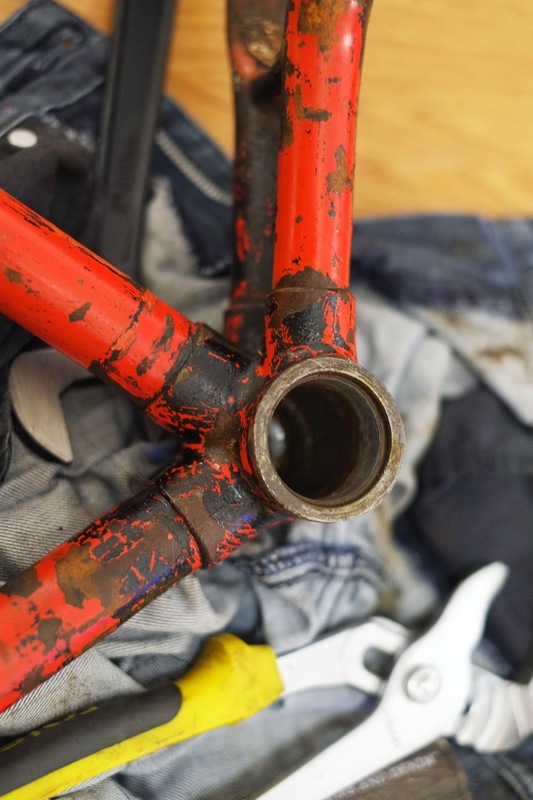 Apart from the easy and obvious stuff like taking off the wheels, chain, rack etc. there are a few slightly out of the ordinary things about this frame. Firstly the headset is a type you don't see all to often, I've seen this type only a handful of times. 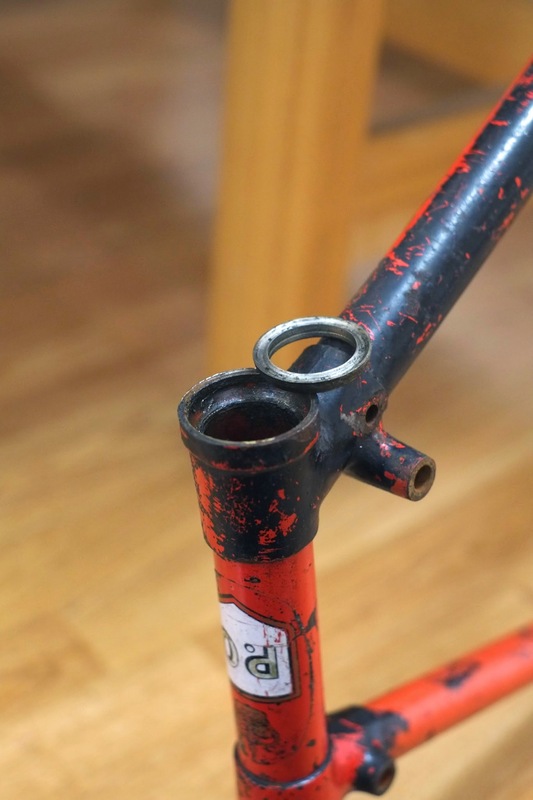 Basically the idea of an integrated headset where the headset cups are recessed into the head tube isn't new, this was somewhat common in the post-war period and it's what this bike has. 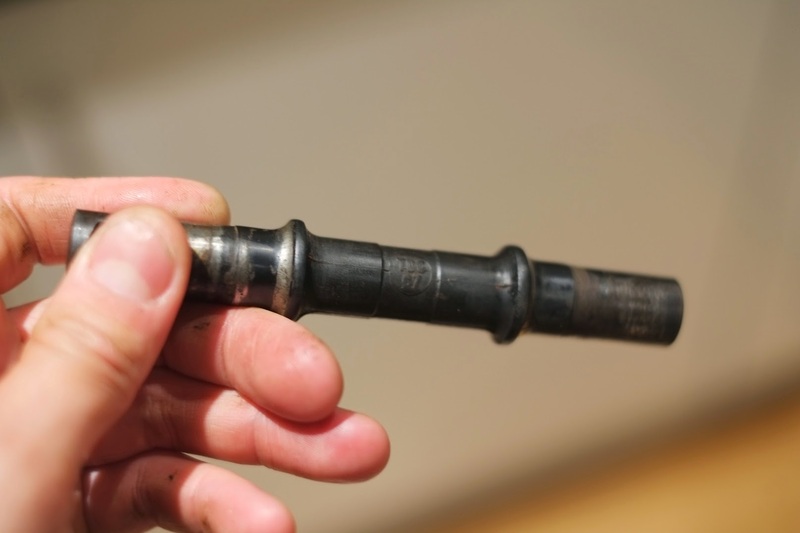 The upper and lower races use 30 small 1/8" loose ball bearings each, the bearing race itself is recessed into a close fit inside the head tube. As you can see the lower race is the same deal, these types of headsets are also unique in that the bearing arrangement isn't an angular bearing like most modern headsets but is more like an axial bearing. The load doesn't go through the ball at an angle, rather it's loaded vertically. 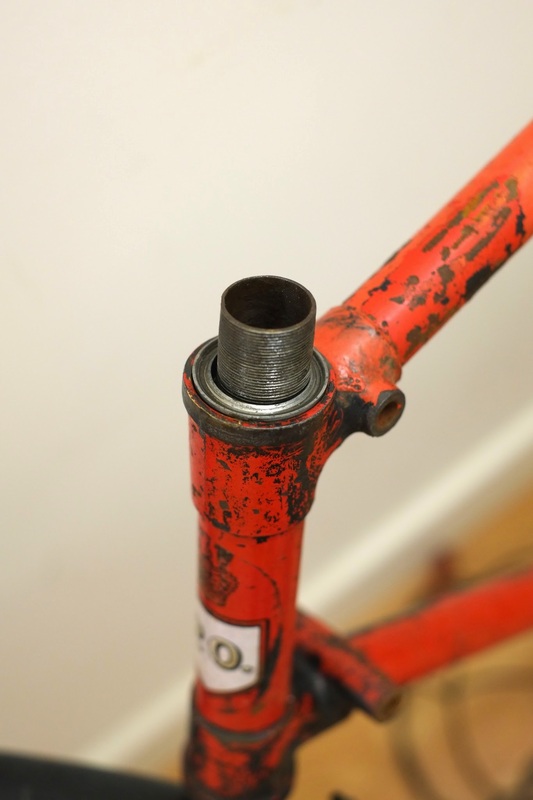 Not surprisingly the fork threading appears to be the unique Raleigh 26tpi. 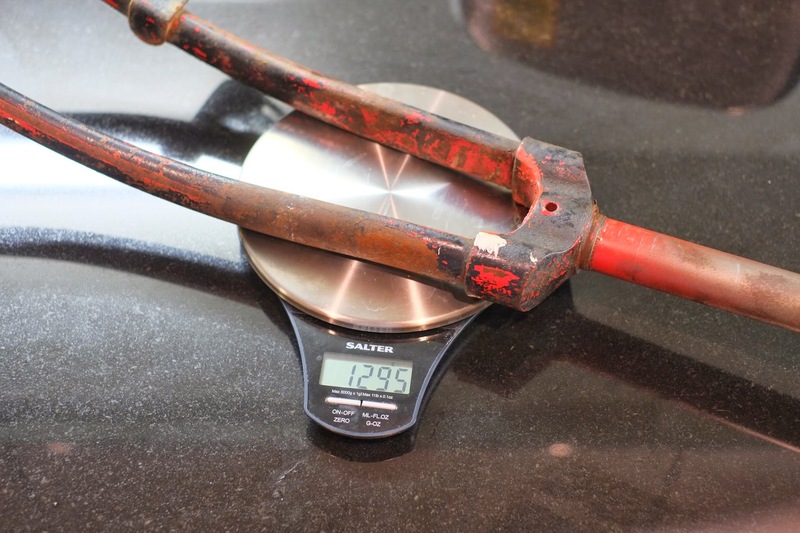 The bare forks are very heavy duty, they feel solid and they weigh like they are solid too coming in at 1.3kg. 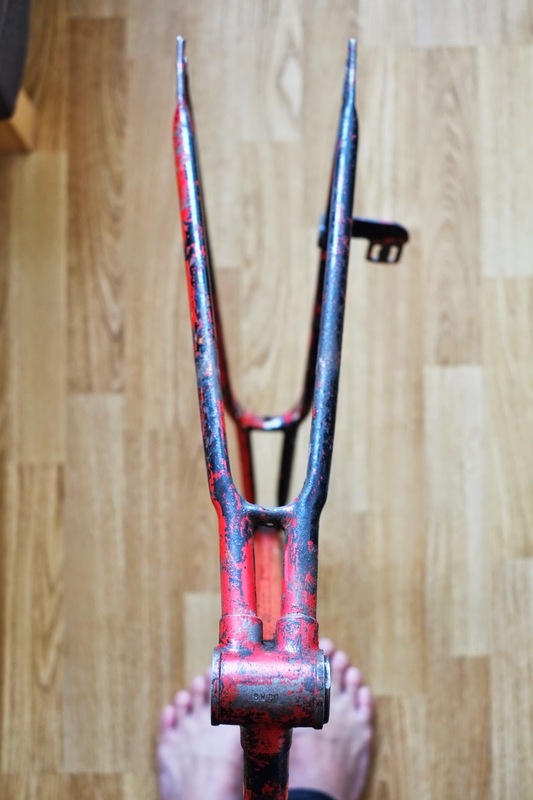 The rake on these is also quite high at approximately 92mm which would mean the trail is quite low, which gives the bike's front end a very light feel. 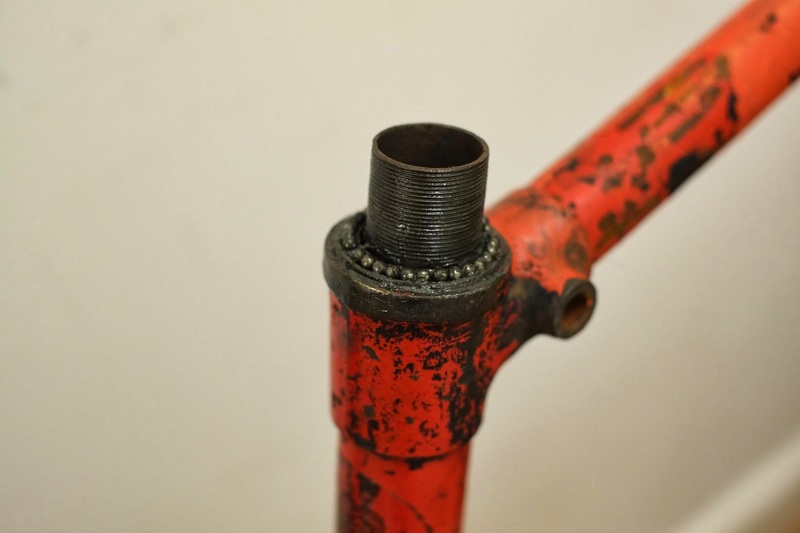 Now onto the bottom bracket, the BB is marked "T.D.C Made in England". 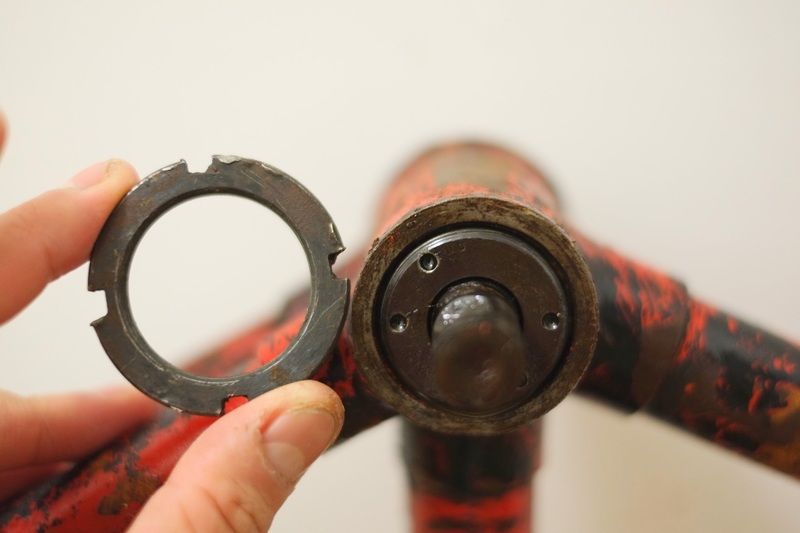 The lockring is slightly unusual in that it sits in a slight chamfer inside the BB lug, rather than sitting completely outside it. The first try to loosen the adjustable cup wasn't so successful, I had to order a special pin spanner to even have a crack at it. After the first unsuccessful attempt, I left it to soak in some penetrating oil for a while. After coming home one night I gave it a really good hard heave and it started to come loose. Finally it came loose, 50 odd years of gunk with it as well mixed with penetrating oil. The BB cups had some slight putting as did the axle. The axle is marked TDC C7, no idea what this means, but it measured as 130mm wide overall with an offset on the drive side. I wasn't so lucky with the fixed cup, it stayed jammed in and it is also an imperial size, 1-1/2" or 38mm which I don't have a spanner for. I decided to weigh the frame and was shocked by how much this thing weighs, I knew it was heavy but near 4kg for frame only is super heavy. I hope this means that the frame is super heavy duty as well. Following that, I decided I'd use the nut and bolts trick to remove the cup to no avail, none of my wrenches were big enough, so I decided to give up and let someone else do it. Whilst I was wrenching on the fixed cup, I noticed that the rear triangle was slightly out, you can see in the photo above that the non-drive side is slightly out more than the drive side. 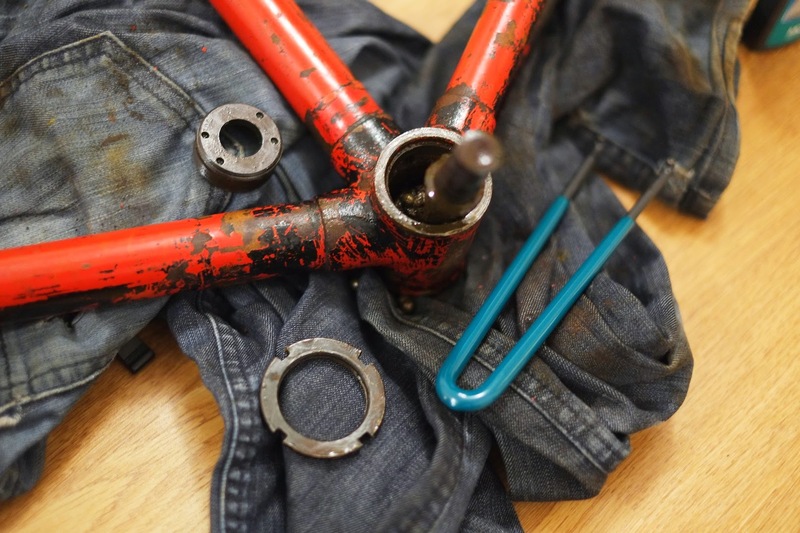 I will be getting some eyelets brazed onto the rear seatstays to fit a rack so I'll get the rear triangle re-aligned as well. All ready to go to the shop to get some eyelets brazed on and a new lick of paint. 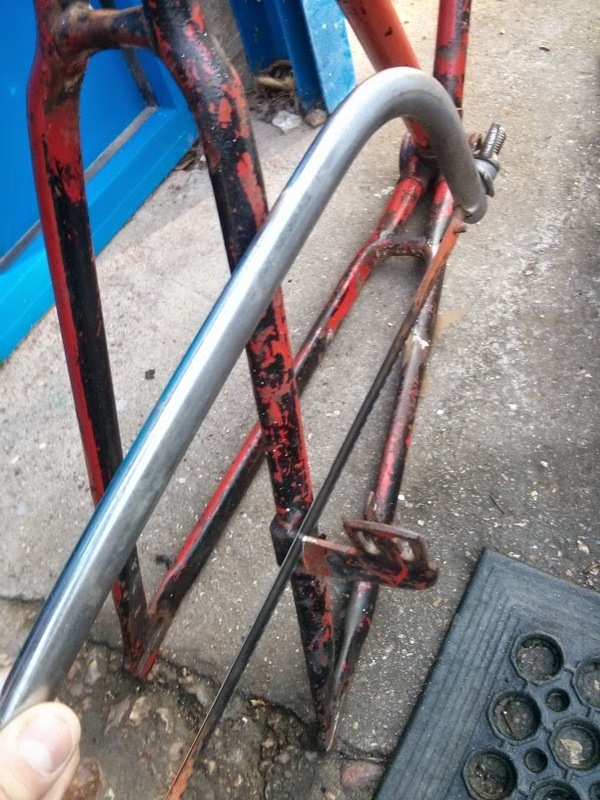 I just realised after I left the frame and forks at the shop that the rear light bracket would get in the way of any rear luggage, so I decided to pop in quickly and saw it off before the paint went on. I'm not too fussed by the leftover nub of the old bracket as this is really a work bike not a show pony. 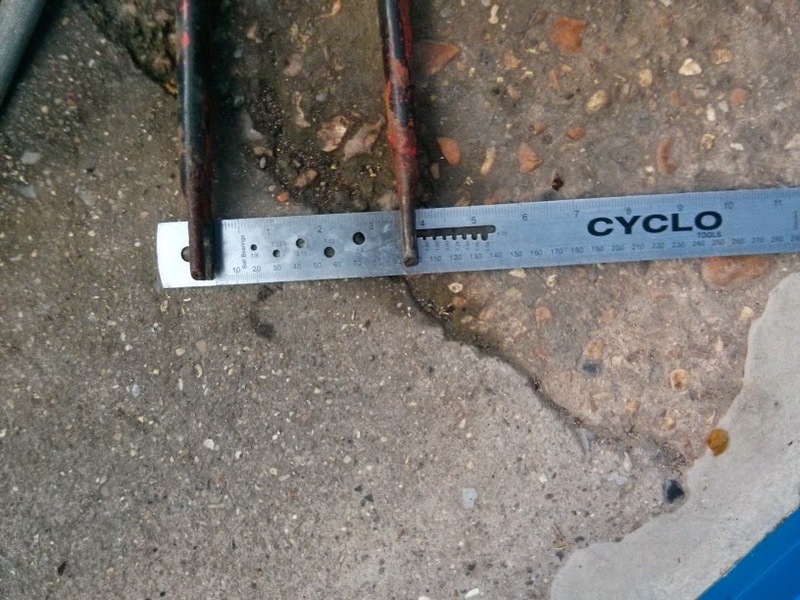 Also I remembered that old English 3-speeds have a narrow front fork opening, usually around 85mm instead of the standard 100mm. I very hurriedly spread them to around 100mm, although I will still need to file out the "keyhole" dropouts and realign them. I'm not too worried about doing this after paint as the dropouts will get scratched from use anyway. That's all for now, stay tuned for more! 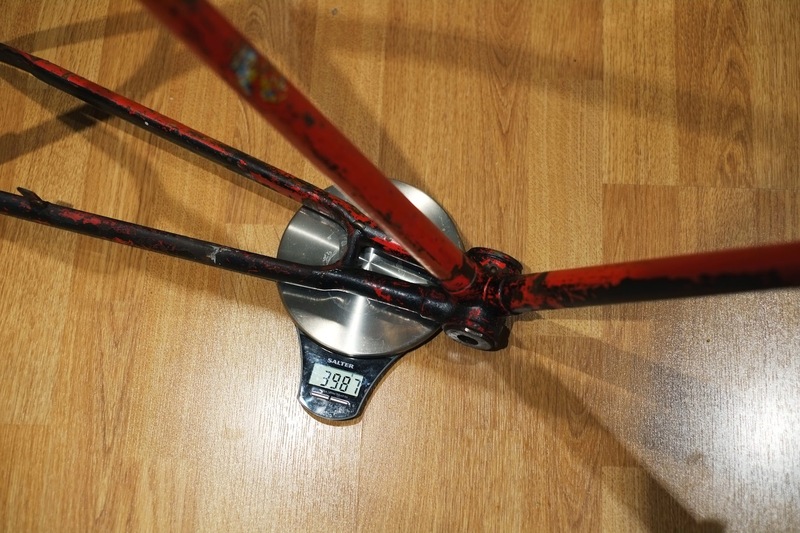 keep em coming, 4kg+ frame only, wow..
Hi there, i know im bringing up a mega old post, but ive just acquired a bicycle with the same headset situation and im dying to find out what it is. 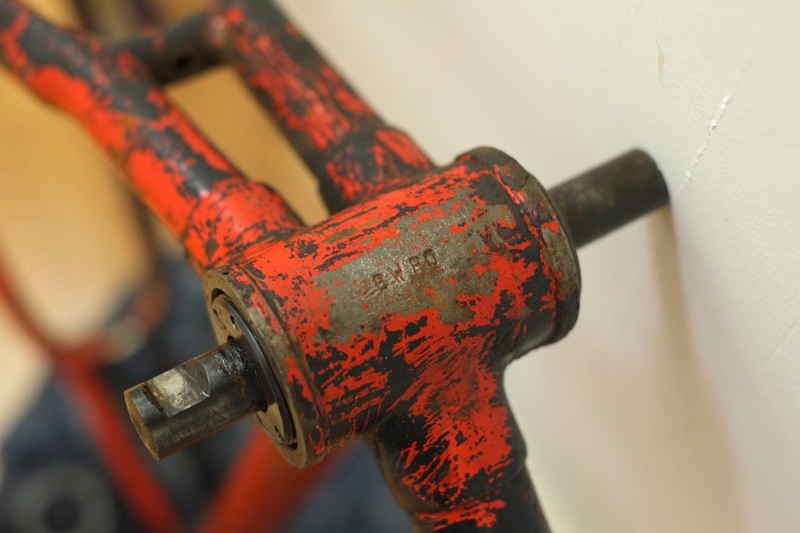 Is a 5 speed fitted with a huret mech, it seems to have BSA 101 in raised brazed on letter on the bb shell but i can find no details about it online anywhere. it has a round headtube badge though, which has been painted (brushed) over but when i scraped it back i could make out the outline of the logo. It looks to me like a crown, out of which is rising an arm holding a hammer (like the toothpaste). 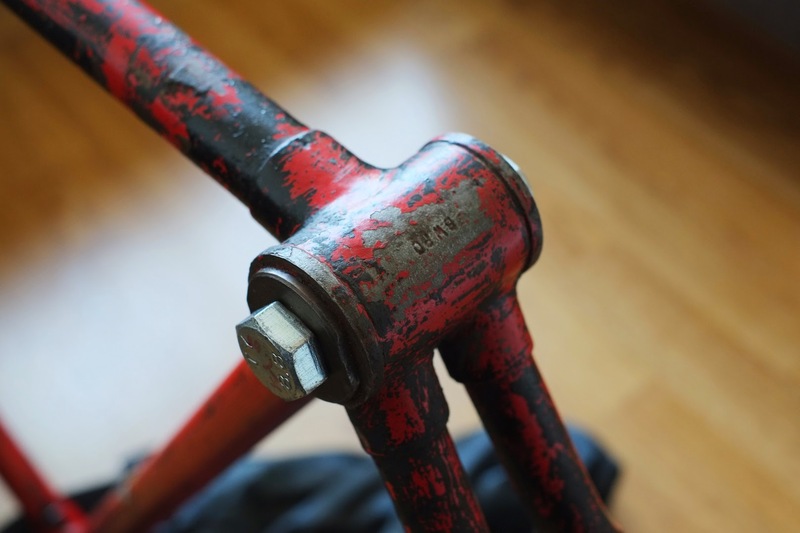 there is a frame number on the left dropout which is a letter then 5 numbers, but i cant make out the first letter that well. Might be a huge longshot but if you have and info about who made your frame at all?